Vijayanagar, the City of Victory, is an apt name for India's most triumphant Hindu nation. Vijayanagara emerged from the crumbling Hoysala empire as its efforts to resist repeated invasions from the Muslim Delhi Sultanate began to fail. Determined to drive back the invaders, the rising Sangama dynasty rallied an army and united much of southern India against their common enemy. Though the Delhi Sultanate was ousted from the south a century ago, Vijayanagar has not seen the end of its struggle against Islamic conquerors. In 1347 the Bahmanis Sultanate won its independence from Delhi and has since become a power in its own right. The rivalry and warfare between Bahmanis and Vijayanagar has thus far been inconclusive; territory has changed hands, tribute has been demanded and refused, yet each kingdom remains steadfast in their determination to thwart the other. Besides its northern rival, Vijayanagar finds itself surrounded by far weaker nations. The Sangamas have allied with the Reddy Kingdom of Andhra, agreeing to protect them from incursions from Bahmanis and Orissa. Though nominally Vijayanagari subjects, the small Malabari kingdoms as well as the Raja of Mysore are largely left to their own devices. The time may come when the Raja requires more of them. The empire's recent conquest of the Tamil kingdoms has not gone entirely smoothly; relations with the influential Tamil trade guilds are poor and must be repaired before the empire undertakes further conquests in the area. 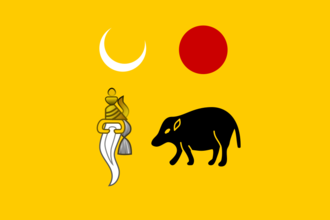 More direct vassalage is asserted over Jaffna in northern Lanka, where the small Tamil nation enjoys Vijayanagari protection from the Buddhists of the Kotte and Kandy Kingdoms. The Vijayanagari empire distributes land to its most loyal and prominent generals in a system known as Nayankara. The Nayaks, provincial governors, administer the lands granted to them and carry the responsibility of raising armies for the Maharaja. Though the Nayaks have thus far been effective, the Raja must be wary of overly ambitious generals who may covet the throne for themselves. In 1444, Vijayanagar is a Hindu monarchy in Southern India. It's in prime position to eventually unite the Indian subcontinent under its flag and declare the empire of Bharat. Vijayanagar's missions focus on consolidating control over South India, defeating their northern rival Bahmanis, and dominating the Indian Ocean trade. Vijayanagar's events are focused on its temples, poets and various interactions with its Tamil populace, including multiple uprisings. Vijayanagar can form Bharat as a Dravidian nation. Have a good strategy for Vijayanagar?